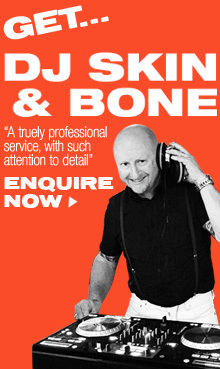 “Music is such a key ingredient of a great party and Vic (aka DJ Skin & Bone) certainly knows how to deliver. Following a recommendation I met with Vic the week before my 50th party to discuss music selection and details for the evening. Vic was genuine and clearly has a great knowledge of music and a huge catalogue to draw from and gave me real confidence and peace of mind that all would go well. The night really went off and I had so many people telling me how awesome the music and the DJ was. Vic knows how to choose the right tracks for the mood of the crowd and keep you going for hours. I’m going to have to have find another excuse to have a party and get Vic back again”! “Thank you so much for last Saturday night. You did a great job. I absolutely loved the music and never thought I’d get a bunch of 50 somethings up dancing like that!! Thanks again will highly recommend you to others if you can handle another bunch of 50 year olds”!! “We were lucky enough to have Vic take care of all our sound and music at our wedding at Mudbrick Vineyard on Waiheke Island. From the first phone call and prompt email exchanges Vic’s calm and confident manner and “nothing is a problem” attitude put our minds at rest. He delivered all of our requirements at the wedding ceremony which included several live instrumental and vocal performances and readings to create a flawlessly executed transition between all elements. His professionalism dealing with the venue staff and our MC was hugely appreciated and meant all stages of the night ran perfectly to time. The dance floor setup was also awesome with incredible sound and lighting which created the most amazing evening. We have absolutely no hesitation recommending Vic to anyone planning a wedding or other event”. …what a great decision that was to book Vic to DJ our home wedding! A true professional, he met up with us prior to understand our tastes and the flow of the evening. On the day, he set up early and was ready to go when our guests arrived. The music was fabulous. He chose all the right songs to keep the evening and dance-floor humming. Loads of our guests commented on how great the DJ was, he helped make our night awesome. Thanks Vic! “As a family owned business we were looking forward to celebrating our Mitre 10 Mega store’s ten birthday. We needed a DJ that could come along and play a good selection of music to a crowd of 100 people who varied in age from 18 to 80. I touched based with him to check his availability, luckily he was free. From there on in it was plain sailing. We just had an absolute brilliant night, Vic played perfectly to the crowd, mixing the music by pace and genre. The dance floor was buzzing all night, the team had a fantastic evening. Did I also mention he is very well priced too? Thanks again Vic, you gave us a night to remember. DJ Skin & Bone? He is the only one to bring a party in your pants. Without him, it’s like fish and chips without tomato source. how can you not like him? He has versatile collection of music, including ska, rocksteady, roots reggae, 2 tone ska, 70s & 80s party music, or punk, and witty speech with sweetness of pavlova. I assure that he will make your jandal feet move.